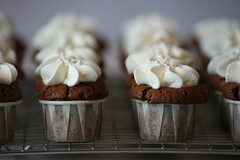 I am bringing these simple and sinful cupcakes to a birthday party. They took no time at all and I barely made a mess - there are just a handful of dishes left for the dish fairy to do. I whipped these together with ingredients I had on hand as it was a last minute decision. In fact, the birthday party we are going to is for a guy we met because of cupcakes. I have been into cupcakes for some time (I registered cupcakebakery.com ages ago even though it basically does nothing but sit there) and stumbled upon a local SF artist whose paintings have a lot of cupcakes in them (in addition to some bizarre things which I like). I purchased a painting from her and attended some of her art shows and eventually my husband and I became friends with her and her now-husband... See? cupcakes really do bring people together. The recipe for the "melt in your mouth" chocolate cupcakes came from a fellow (and very accomplished) food blogger over at chocolate & zucchini. I threw together whatever chocolate I had which turned out to be about 2 ounces of Valrhona bittersweet, 2 ounces of Scharffen Berger bittersweet, 2 ounces of Scharffen Berger milk chocolate, and 1 ounce of Scharffen Berger unsweetened. I made this cake once before (with all Valrhona) and both times the outcome was absolutely fantastic - the perfect chocolate experience... super moist, chocolately, rich, not too sweet, and with a nice crust on top. Very cool site! Your cupcakes look amazing. One question though, do you bake the batter in little portion cups so that you don't have to use a muffin pan? Do they come out easily from the cups? Great picture. I certainly hope all these posts become a cupcake book someday soon. Hey, you could even publish it yourself via lulu.com. could you post the recipe for the actual cake part of these cupcakes? julie - i have been experimenting with the portion cups because i think they are cute. they stand up by themselves, i just line them up on a sheet pan. they are a little trickier to eat from though. they are hard to tear apart so most people were squeezing the cupcakes out and eating them, which seemed to work fine. i have 3.5 ounce cups as well, and they were a bit easier to deal with then the 1 ounce cups. chubby hubby - i have been thinking about that in fact. i didn't know about lulu.com though, thanks for the tip! addie - i provided a link to the recipe that is from someone else's blog. seemed like the right thing to do (as opposed to reprinting the recipe). thanks! Thanks for the scoop on the portion cups. That was a brillant idea! I too am cupcake obsessed. I wrote a cupcake book that came out earlier this year. So professionaly speaking, your cupcakes rock! I can't wait to see what you do next. Chockylit, your Devil's Food and Chocolate Buttercream recipie worked great for me, a total moron. I can't wait to try your other recipies now, although I'll be sticking with the simplier ones. Thanks for helping to make my bake sale a success! Oops. I forget how long I baked them for. Sorry! Generally, it takes about 75% of the time. I filled these about 3/4's full. love your site! how many cupcakes did the recipe make? So delicious and so easy! This is a great recipe to toss together before a party. 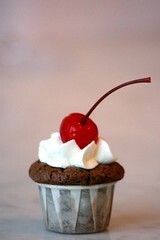 I replaced the cherries on top with chocolate shavings. They looked smashing!